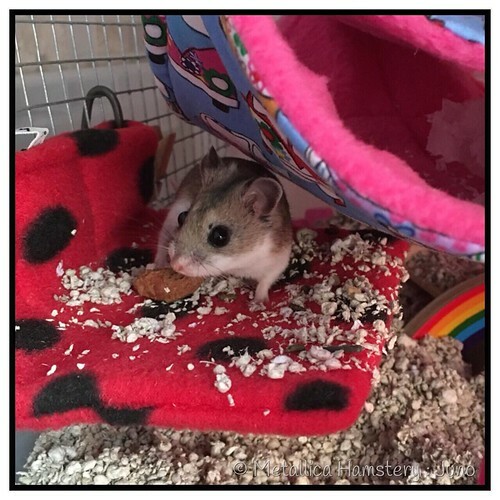 THIS COMPETITION IS FOR A PICTURE of Hamsters 'A HAMSTER PLAYING WITH A FAVOURITE TOY' so the photo should be one that shows a hamster interactive with a toy. The toy should be hamster safe and appropriate and should be in the picture eg running on a wheel or through a tunnel or anything you feel is appropriate to represent the theme is acceptable. NO PHOTOSHOPPED OR COMPOSITE PICTURES PLEASE. 5. Closing date for entries is 23rd April 2019 at midnight GMT. 6. The voting will be posted and the new pic will be displayed in May. Each member will have 1 vote. The poll will be public and you may NOT vote for your own entry. Voting for another family member's entry is highly discouraged. 8. It must be pictures of hamsters 'A HAMSTER PLAYING WITH A FAVOURITE TOY. If you post a picture that is not themed you will be asked to replace it with one that is. If you do not do this is will NOT be included in the competition. Last edited by souffle; 04-10-2019 at 05:10 AM.